Using old coffee grounds for something useful seems like a great idea. So I set out to find some useful ideas for coffee grounds. 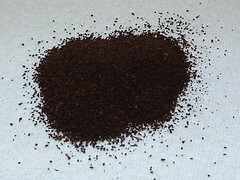 As you might guess, there are many suggestions for reusing or recycling coffee grounds. I’m not going to bore you with a list of 50 things that you might try but let me share one useful way to use old coffee grounds. First I have read that coffee grounds can be a good fixer for scratches on your furniture. So this was my first test. I took some coffee grounds and to see if it would fix my scratched bed frame that we bought 2nd hand. I rubbed some damp coffee grounds along and around the scratches gently. I then wiped off the grounds and cleaned up the surface with a towel. The results were that the scratches were hidden and not so noticeable but there were still there. I then tried the coffee grounds on a darker coffee table that had a few scratches. The results were much better and the minor scratches were nearly gone and not really noticeable at all after applying some recycled coffee grounds on the scratches. The bottom line — Using coffee grounds does help hide scratches on wood furniture. It appears the darker furniture scratches are hidden better with an application of old coffee grounds than light-colored furniture. So if you have some scratches on your wooden furniture, give this useful idea a try. You have nothing to lose but some scratches, right? I am going to try this tomorrow! this is a great idea! i am going to try it this weekend. What a logical thing to use. I had never thought of doing this, but since we moved (still finishing up) I have found a few dents and scratches. I shall give this idea of yours a go and hope for a little successes. merci beaucoup!